Valerie Jarrett, who was a senior adviser to the President during the Obama administration, has been appointed a distinguished senior fellow at the University of Chicago Law School. When she begins her new role in January, Jarrett will participate in academic seminars, conferences, and student-led initiatives. She will continue to focus on issues of gender equality, criminal justice reform, health care, and civic engagement. 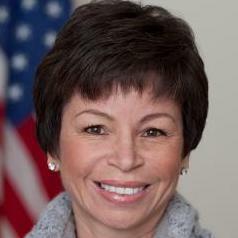 Before serving in Washington for eight years, Jarrett was vice chair of the University of Chicago board of trustees and chair of the board of trustees of the University of Chicago Medical Center. Earlier, Jarrett held several positions in city government in Chicago including deputy chief of staff to Mayor Richard Daley, commissioner of the Department of Planning and Development, and chair of the Chicago Transit Board. Jarrett’s father, James Bowman, was the first African American to gain tenure in the department of biological sciences at the University of Chicago. Her mother holds a graduate degree in education from the university. Jarrett is a graduate of Stanford University, where she majored in psychology. She holds a juris doctorate from the University of Michigan Law School.